The fourth Members’ Meeting was held on 30 October 2018 in Berlin and was attended by over 120 people. You can gain an impression of the day and find documents from the dif-ferent workshops in the Members’ area. 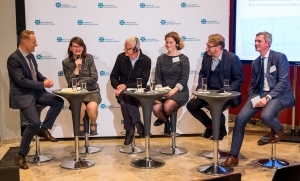 Internationalisation was the main subject of the panel discussion on the evening of the Members’ Meeting. The Members’ Meeting provided a framework for seven different break-out sessions whose results will now feed into areas such as the work of the various expert groups. Under the slogan “Learning from one another – jointly achieving targets”, ten selected projects presented approaches for making processes and products more sustainable (see News from the projects). An open space session offered participants a chance to gather and jointly develop ideas for new Partnership Initiatives. In addition, the concept for the Partnership Initiative on Living Wages was presented and discussed. The expert group has channelled feedback into the ongoing development of the concept, which has now been approved (see also Living Wages). This topic was also the focal point of another break-out session. An interactive case study was used to introduce the method of open costing and to explain the connection between open costing and living wages. Participants attending the Understanding and carrying out due diligence workshop had an opportunity to discuss in small groups the specific challenges associated with carrying out due diligence. Interested members also peered into the future of the textile industry and learned about current trends in innovative fibres. The major opportunities and risks of automation were at the heart of another workshop where the global impacts of increasing digitalisation in the textile industry were also discussed.